Recorded In concert at 19 rue Paul Fort, 75014 Paris, 1st and 2nd December 2017. 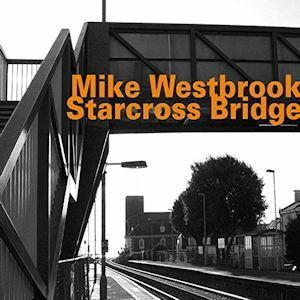 Mike Westbrook’s last solo album was Paris and Starcross Bridge – the railway station in Devon near his home – is a perhaps unexpectedly swift follow-up given the extreme rarity of his solo outings on disc. The album is divided into ‘chapters’ and throughout it the range of influences, echoes and reflections is wide. Westbrook evokes John Ireland in his setting of Samuel Crossman’s hymn My Song is Love Unknown and is indebted to them both in the title track which he dedicates to his old friend, tenorist Lou Gare, and plays with an elliptical quotient of melancholia rather than as overt Trauermusik. The teasing harmonies of Monk’s ‘Round Midnight have their necessarily bluesy paragraphs but offer an essentially independent and parallel approach to the composer’s own. And turning to Lennon and McCartney’s Because allows Westbrook some rich chording in a slow, measured approach which embodies a somewhat deconstructionist approach to melody and harmony. Brazilian Love Songs is a co-composition with his wife Kate, and its rhythms slowly emerge to good effect whereas Billy Strayhorn’s Johnny Come Lately is bathed in dappled impressionism as well as more incisive articulation and emerging the more inscrutable for all that. Monk’s Mood draws the first chapter to a meditative close without any attempt to mimic or incarnate Monk’s own style. The effect of listening here, as one track as often as not flows into the next, is to experience a kind of musical stream of consciousness without much breaking up of the mood pictures evoked by Westbrook. It’s an element that recurs in chapter two, where the melancholic I Got It Bad attests to his admiration for Ellington. By far the longest track is the ten-minute View from the Drawbridge, dedicated to his wife, where the music slowly evolves sometimes to evoke traceries of romantic reverie. But he follows this immediately with the Thom Bell-Linda Creed song You Make Me Feel Brand New which, like Because, requires necessary clarification in its chordal statements. The slow spare Blues for Terenzi and the longer Rooster Rabelais make up the third chapter which is followed by a Postscript, an arrangement by Westbrook from Rossini’s Barber of Seville called L’Amoroso e Sincero Lindoro. It offers a touching but strangely bittersweet envoi. There are interesting notes from Philip Clark, and the sound quality is excellent throughout. Be prepared to encounter an album that charts love and loss alike in a subtle but never evasive way.